The latest news in the smartphone market is the release of Android L operating system by Google and everyone who owns an android device is looking for whether their device will be getting the Android L or not. Android L has got a lot of updates from the previous version not just cosmetic but also some apps which are useful in our daily life like the default ART Runtime to make your android device run much faster and Volta which will saving and prolonging your battery life to a great extent. The updates along with the minimalistic and flat design concept which is in the market are going to make Android L a very great operating system. But to get Android L on your devices you have to wait till 2014 Fall and if you want to try it out before that you can install the developers version. 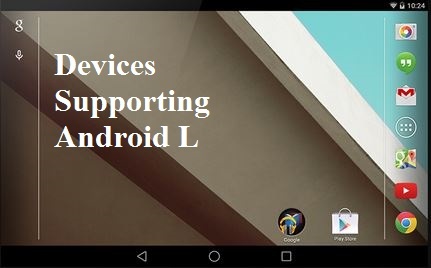 The devices which we have mentioned in the list above are the ones which are expected to get the Android L update after its release but some other devices which we have left out because there is no conformation about the update being available for Android L in Smasung, LG, Sony, Motorola and HTC phones as of now. We will be updating the complete list as soon as we get our hands on it.